Now is a great time to get to know the experts at Horst. We focus on both Design-Build and Capital Improvement projects that require exceptional leadership, quality workmanship, efficient project management, and timely completion from a trusted partner. This can be seen in our work as the design-builder of American Music Theater. 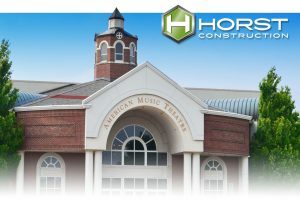 Visit Horst Construction on October 7, 2016 at this Unique 55,000-Square Foot Entertainment Venue. Enjoy a day of leadership alongside your peers at this one of a kind venue in Lancaster, PA. When you register for Live2Lead, use the code ‘Horst’ to receive $15 off the individual ticket price. If you are planning to attend, please stop by our booth and meet our team. For over 120 years, Horst Construction has been synonymous with integrity, quality, and collaboration. We listen first, and then build what matters to you. We work as a team to ensure your goals are achieved…beyond your expectations. Horst services for exceptional environments include: Preconstruction Planning & Budgeting, Cost Management, Project Management, and Construction.